Youma Fall used to set her school books aside for her younger siblings. Then she realized the books could be put to use in other ways in a country where many students struggle to own even pencils and pens. 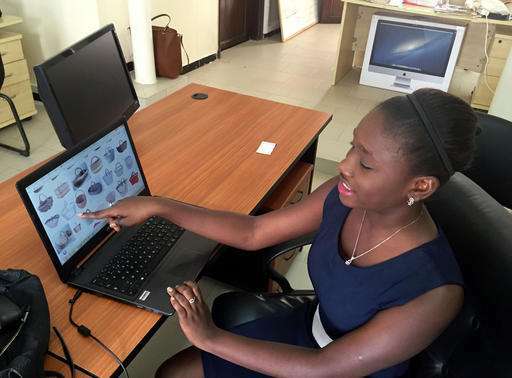 Nearly a decade later, the 24-year-old is bringing her idea to life through a program in Senegal that encourages young women in coding and technology. She is developing a mobile phone application that will allow teachers, parents and students to swap books and supplies. It's called WECCIO, or "exchange" in the local Wolof language. "When I finish this, I truly hope that no child has to say they don't understand something because they didn't have a book to study," said Fall, a design engineering graduate. She and a new community of young women in this largely Muslim West African country are pushing cultural and gender boundaries, using coding and entrepreneurial skills to enter a booming mobile technology movement traditionally led by men. Mobile phones are central to online life in Senegal. Nearly 95 percent of internet connections in the country occur via mobile phones, according to research by the Regulation Authority of Posts and Telecommunications of Senegal. But less than 30 percent of girls in Senegal have chosen to study science and technology fields, such as mathematics, physics or engineering, said Bitilokho Ndiaye, gender adviser at the ministry for posts and telecommunications. Ndiaye has made it her mission to help Senegal enforce its gender-equal policies in technology, and to create career opportunities for young women. "Often, people are tempted to think that the girls are not able to do certain professions. This is due to the sexual division of labor, and its history and culture," she said. Ndiaye helped to create the coding and tech community for young women, called Jiggen Ci TIC, or "Women in Technology" in Wolof, whose partners include UNESCO and telecom provider Sonatel. There are training opportunities across Senegal throughout the year, including an intensive month-long session that leads to a weekend competition in which teams of girls present mobile apps to address pressing local issues. More than 100 young women participate. The program chooses the three best projects, financing their development. The other girls also receive leadership and entrepreneurial training, with mentoring and support to help complete their projects. The programs also encourage Senegalese to realize that tech innovation doesn't have to come from beyond the country's borders, said UNESCO's regional Adviser for Communication and Information, Sasha Rubel Diamanka. One app created by the Senegal project will allow pregnant women to keep medical records for themselves and their children on a mobile device. Another allows Senegalese to identify land that is for sale, using city records to prevent and resolve land disputes. With its partners, the government plans to set up regular trainings in all regions of Senegal and integrate coding classes into the national curriculum. Ndiaye, the adviser, hopes to one day see a tech incubator only for girls, including mentorship and dedicated teachers year-round. Senegal's push toward a digital future is strong. Last year, the country was ranked 11th in Africa for information and communication technologies development by the International Telecommunication Union. The country is building a digital technology park in the town of Diamniadio, about 30 kilometers south of Dakar. Last year, the African Development Bank said it would invest nearly $80 million in the project, estimating that it will generate at least 35,000 direct jobs and 105,000 indirect ones by 2025. Young women like Fall see the developments as only the beginning. Fall is now applying the skills she has learned to her job at a mobile banking startup. She also continues coding courses while developing her app with the winning funds. She talks of creating another app to help women sell local products, and of following a career path that encourages other girls to work in the technology field. "We need models. We need other women to say it's possible for us to reach new levels," she said.